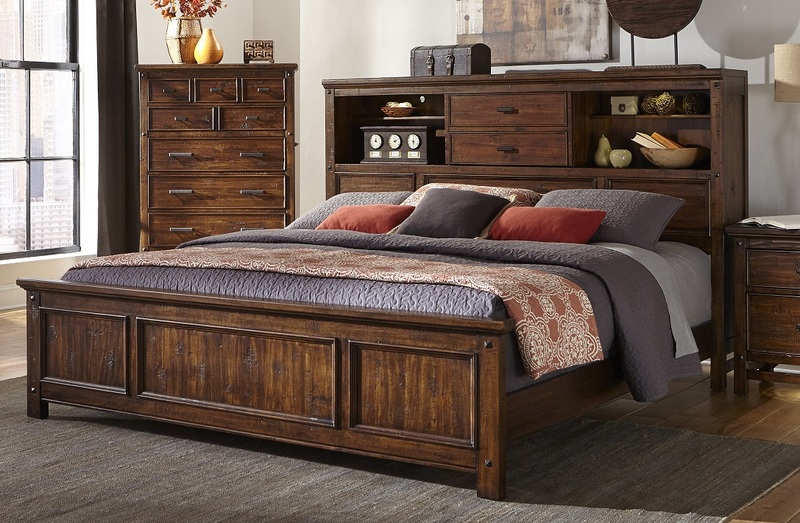 As if it were multiple pieces rolled into one, this wonderfully practical Wolf Creek Bookcase Bed is an absolutely fabulous piece of furniture. With drawers and shelves available at your head, LED reading lights mounted to the bottom of the shelves, power strips on each side, and wiring between compartments, you can almost live in your beautiful Wolf Creek Bed. Besides this oh-so-useful headboard, this bed can be ordered with your choice of plain or storage side rails. You have a choice of two plain rails, one plain and one three-drawer rail, or two three-drawer rails. How about that for practicality? Price shown is Queen bed with two plain rails. Two rails must be ordered for each bed. Please see drop down option window, or call for information regarding storage rail options. 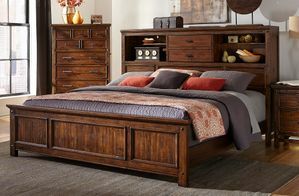 The Wolf Creek Collection of furniture features pieces constructed of Acacia and other select hardwoods. 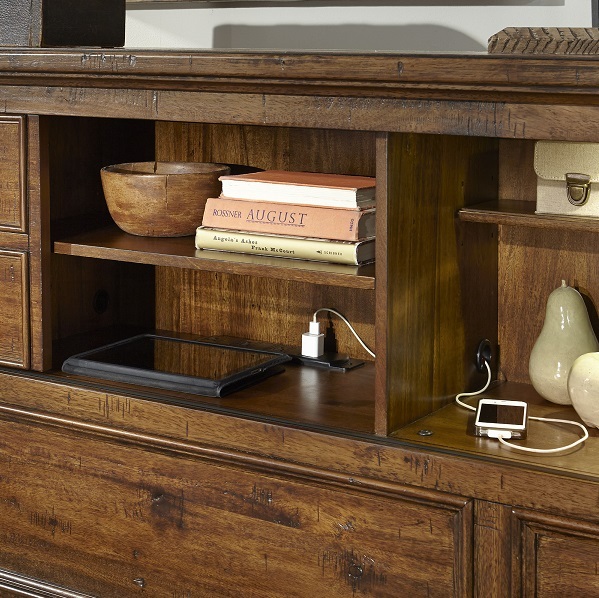 Each piece is hand-distressed for that perfect rustic look, and is finished in a beautiful Vintage Acacia finish, which deepens and highlights the grains and faults for rich beauty. 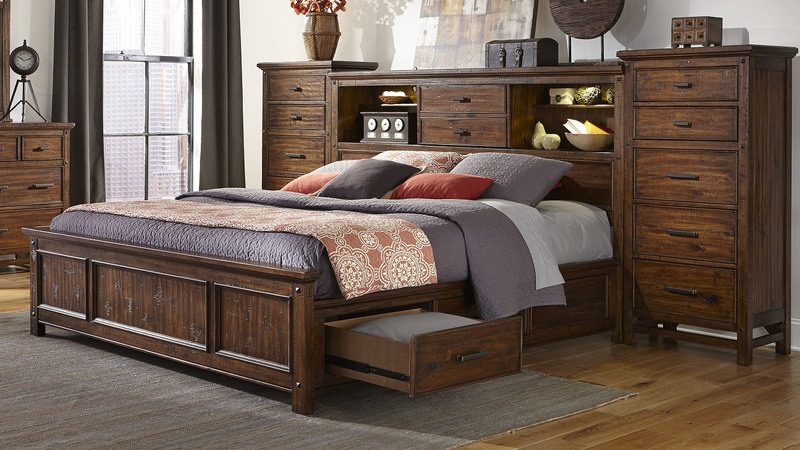 This Wolf Creek Bookcase Bed is available with Universal (plain) rails and with three-drawer storage rails. You need to order two rails per bed, and you can order the configuration that works best for you. See drop-down window for pricing. Please call to order specific configuration. This bed is available in Queen and King sizes. Free Shipping to the lower 48 states for Intercon orders over $1500! For Intercon Furniture orders under $1500 the shipping charges to the lower 48 states is $150. Estimated ship time from order placement is approximately 2-6 weeks. Some in stock items may ship sooner. Please call for ship quotes to Alaska, Hawaii, or Canada. For in-stock items that are shipped right away, full payment will be due when order is place, for items not in stock, a fifty percent deposit is due at the time the order is placed, and the remainder will be charged when the item is shipped. Currently no video is available for this furniture collection.